At Whiskas, we’re not only committed to developing delicious products, but we also want to make sure that the packaging for those products is as environmentally friendly as possible. TerraCycle® is the world leader in the collection and reuse of non-recyclable post-consumer waste. TerraCycle® partners with brands offering products with packaging that can’t be recycled by municipal systems and which would end up in landfill or being incinerated. TerraCycle®’s ultimate goal is to Eliminate the Idea of Waste®. This is done by recycling the waste packaging, with the materials being repurposed as new products. To date, over 80 million people are collecting globally with TerraCycle®, over 4.1 billion pieces of waste have been diverted from landfill and incineration, raising over £16 million for schools, charities or non-profits around the world. TerraCycle® reuses, upcycles and recycles waste instead of incinerating or landfilling it. This moves waste from a linear system to a circular one, allowing it to keep circulating in our economy. Once collected, the packaging is sorted, shredded and washed. The material is then densified into hard-granulated plastic granules that can be used to make new recycled products. Click here to learn more about the recycling process. 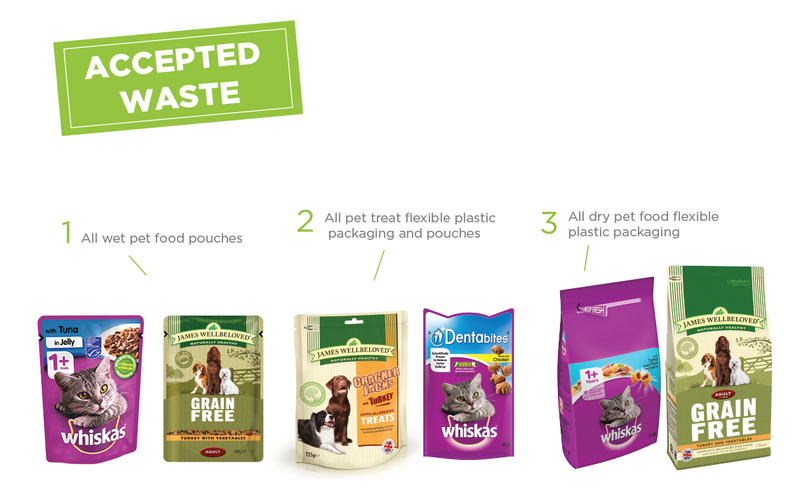 Create your profile on the TerraCycle® platform and select the Pet Food Recycling Programme.It won’t cost you a penny! You can collect at home or find the closest collection point and drop-off the accepted waste there. You can also become a public drop-off location for your community by simply filling in this form. If you’re a home collector, send your waste to TerraCycle® using a free postage label. TerraCycle® will make sure all the accepted waste is recycled into plastic items such as such as benches, watering cans or plant pots. On top of this, we will reward you with points which can be redeemed for charitable donations. Mars Inc. has committed that globally all packaging will be 100% recyclable by 2025. We’re working with industry partners and workgroups to help us reach this goal. Find out more about our recycling commitment here. Partnering with Terracycle® is a critical step in our journey towards fully recyclable packaging. Quality packaging helps to make sure the products you love reach you in a safe and sustainable way. It allows efficient transport and prevents food from spoiling. It also differentiates our brands on shelf while giving consumers vital information about our products. It’s important to be as efficient as possible in our packaging. We need to find ways to keep protecting our products while doing as little harm as possible to our environment.